I have a home project to replace the DirecTV satellite boxes with PCs. So far so good. To make it easy to use I needed a wireless keyboard and mouse. The first box ended up with a Gyration Media Center Remote. 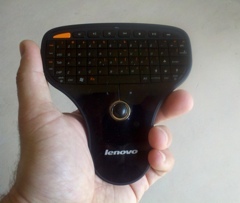 For the next box I found a Lenovo Mini Wireless Keyboard with trackball. I purchased it new from the local CompUSA for less than $40. Upon opening the box I was impressed with the product. It fits in the hand well and is easy to use. The keyboard includes basic media player controls, essential for pausing the movie to grab another drink. Installation was a joke, plug in the micro dongle to an available USB port, install the two (included) AAA batteries and switch on the keyboard. In less than 15 seconds Windows 7 recognized the device and it began working. I removed the wired keyboard and mouse and put em back in the parts locker. Holding the device in the palm of my right hand I can reach most of the keyboard with my thumb. The shape makes it very comforable to hold. The small power switch is located on the underside of the device and it out of the way so it will not be accidentally shut off. Turning the keyboard will save battery life considerably when not in use. Turn the switch back on and I reconnects immediately. My typical use is from about ten feet away and it works great. Being wireless instead of infrared makes operation painless. I did some testing and was able to use over 25 feet away from the PC in a different room. Good enough for me. Anyone used this before? Leave a comment. Still using this little guy. Battery life is pretty respectable. Would love to hear of any similar (read that as better) devices.